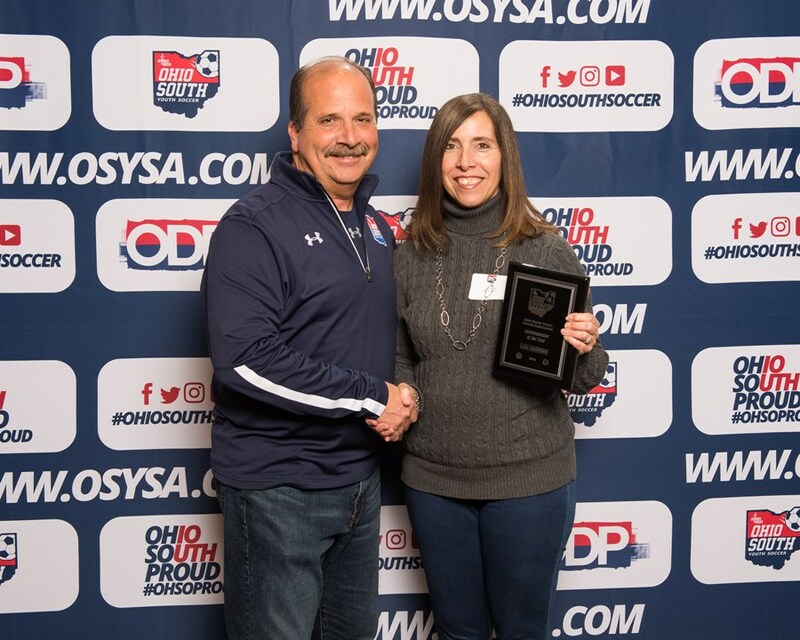 Congratulations to the 2018 Ohio South Youth Soccer Award winners! Paulo has been an extremely positive impact on soccer in the Warren county area. 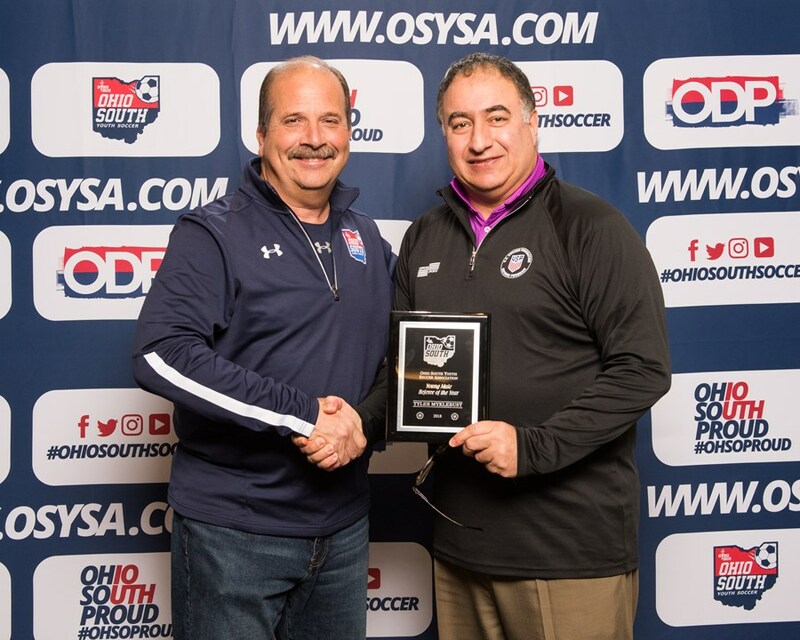 He has a USSF “A“ license, professional experience in three continents, and over 20 years of experience as a trainer and Director of Coaching. Not only has he raised each of his teams to high levels of success, but he has also infused his love of the game into the girls he has coached. He dedicates many hours to analyzing teams, determining where the girls’ natural abilities will best suit them on the field, and training them on technique as well as working together as a unit. Paulo brings his professional soccer experience from Brazil, and imparts the correct way to play “the beautiful game” to his students. Neil ‘s coaching philosophy is to help support and embrace each player and give the individual player opportunities to have fun, enjoy the game, and pursue excellence in their skill level as the player develops. He believes soccer is a beautiful game and must be played with the right spirit. The outcome of a match is not as important as the lasting impressions of teamwork and good sportsmanship. Neil has completed his USSF “A” license and the National Youth license. 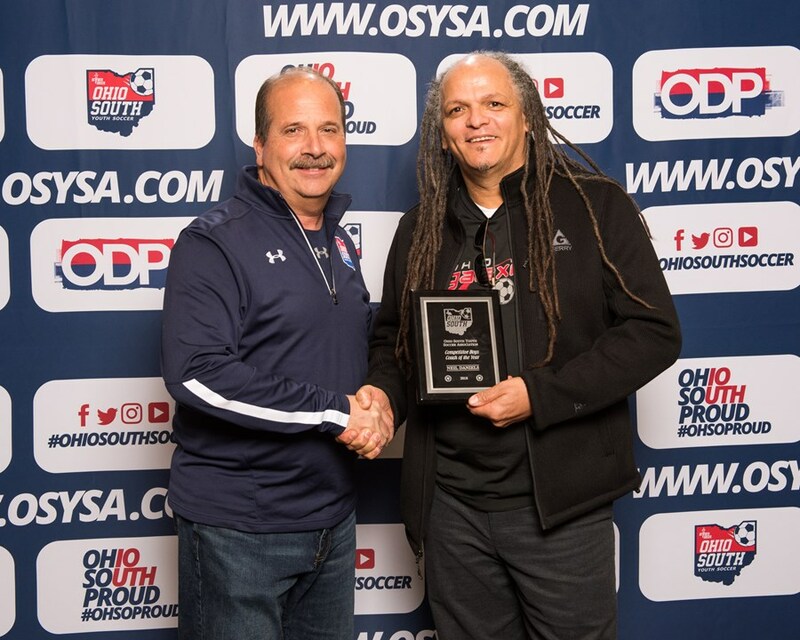 Neil has served as the Director of Coaching for the Ohio Galaxies FC high school club soccer program since 2001. 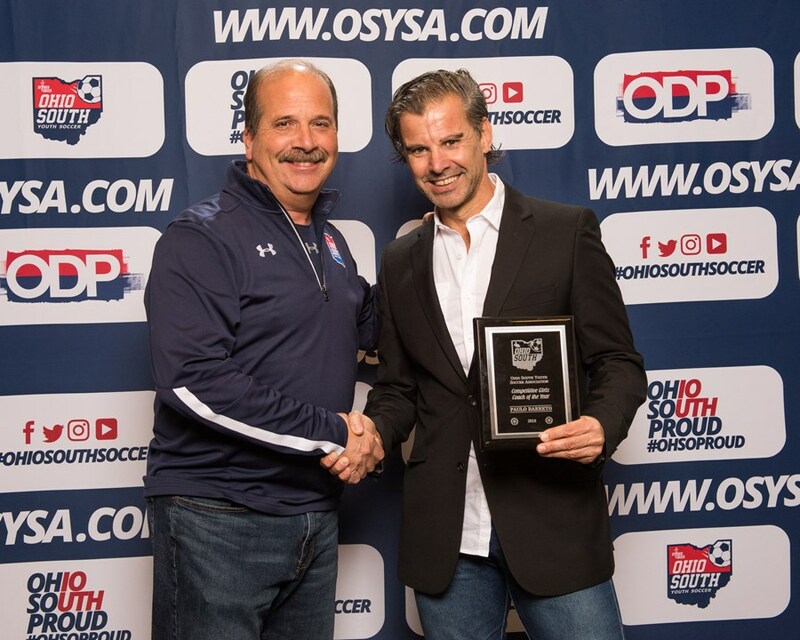 He serves as the head coach and assistant coach of various Ohio Galaxies FC boys teams. 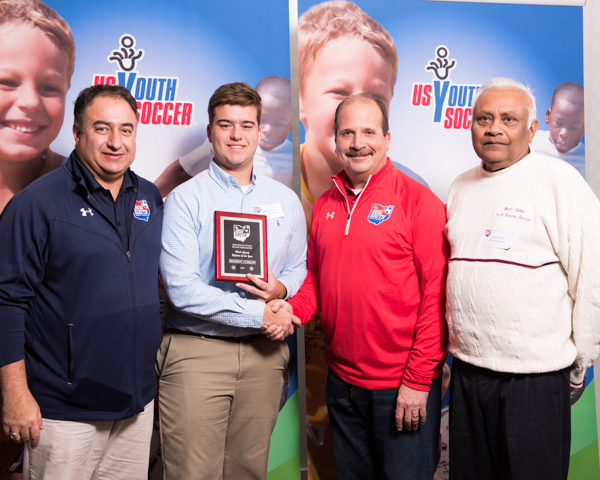 Neil is an active participant in the United Soccer Coaches Association and regularly attends the United Coaches/USYS annual convention. 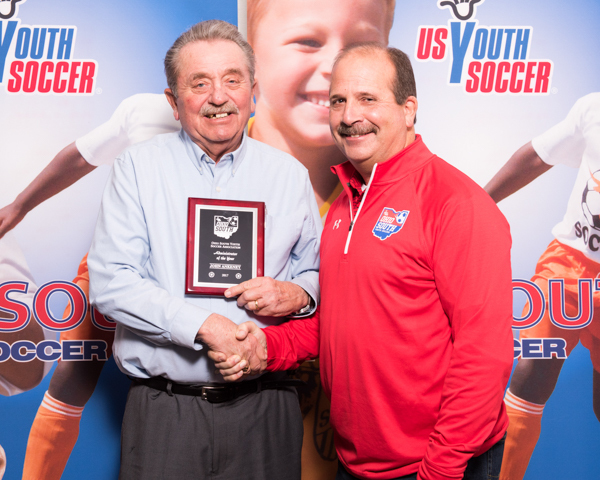 His participation in training and development sessions offered at the annual events keeps him informed about trends and new techniques in the education and development of youth soccer players. This is the second year Kendra has directed and coached the U6/U7 program where the players practice one day a week in an academy style format and play 4v4 games on Sundays. She was initially hesitant to take on this assignment as she was used to coaching older ages but jumped in with both feet and never looked back. Kendra has a USSF E license and has coached with Sporting Columbus/Crew SC since the fall of 2014. She has been an excellent role model and leader for not only the players but also the parents. She brings passion and energy on to the field and communicates weekly with parents promoting the importance of development (over winning) and proper sideline behavior. Elizabeth started volunteering for TopSoccer in Mason in August 2016. She started working with the “rollers” group, and as time passed she developed a relationship with the players who became very important to her. 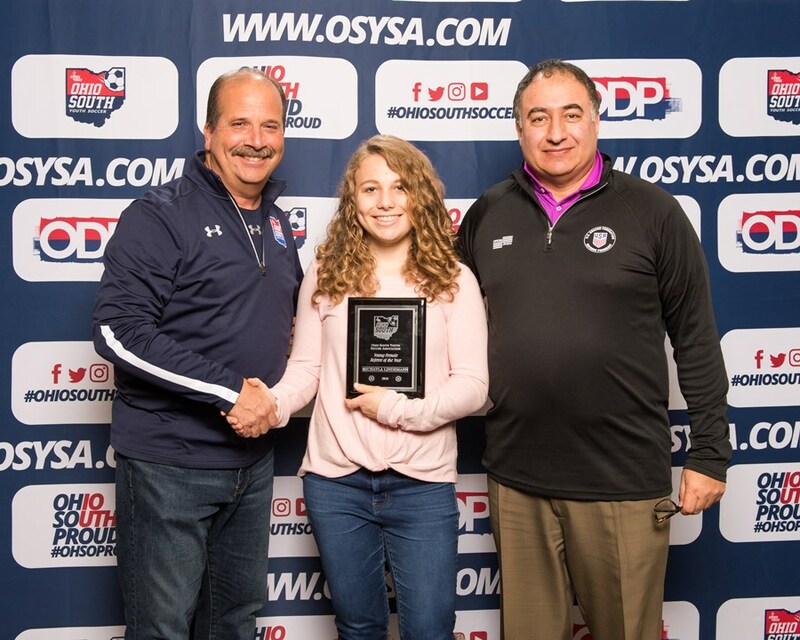 In August 2018, on the first week of TopSoccer practices, Elizabeth was the only volunteer to show up for the rollers group, which had a record number of players. While she was excited to have so many new players, she was devastated that she was the only volunteer and could not possibly push 19 wheelchairs by herself. This started a zealous quest for more volunteers. After soliciting friends, students, and teammates, Elizabeth again approached her school’s campus ministry in a final push for volunteers. She told them she would help coordinate/track service hours and even help secure rides for the kids that didn’t drive. After weeks of asking everyone she knew, she found out that there were 25-30 freshmen who signed up. Elizabeth is a great athlete on the soccer field and a great person. She loves to volunteer with Top Soccer and her passion for this organization shows when she works with the program. Her stories show how much she loves teaching others and having fun with the kids. 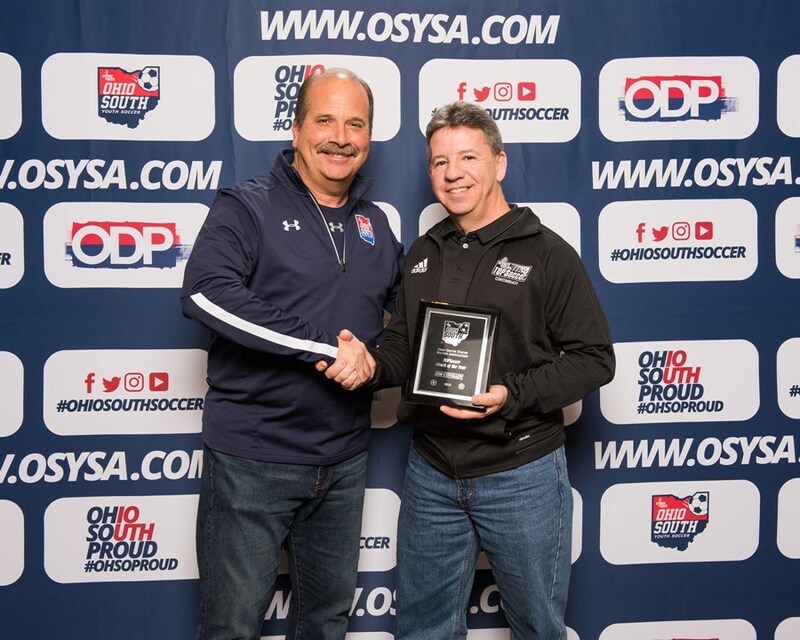 Jim has been involved with Cincinnati TopSoccer for 19 years. He began as a parent of a player (who is still playing) and quickly volunteered to coach a team. Since that time, Jim has been a strong proponent of the program recruiting additional players and coaches. Jim continually challenges himself and the entire coaching staff to be better than they were yesterday. His compassion and genuine interest in each and every player is evident at all times. The players love and respect him greatly. Jim continually promotes TopSoccer throughout the community. He provides information to other special needs programs in the area such as SNAPDragon baseball and basketball. In 2018 alone Jim fostered a 56% growth in players for the Eastside location. Jim’s desire to provide the best possible experience for the kids is always at the forefront of his decisions and strategy. When the Big Cat Soccer club was being formed, the founding coaches were sometimes overwhelmed with the new processes. The coaches had busy schedules with small children and full time jobs. Kristi, a coach’s wife and soccer mom, stepped up to volunteer. She supported the coaches and took care of paperwork and whatever else was needed. She took photos, uploaded documents and drove to Dayton get cards for the teams. She did a tremendous amount to help the Big Cat Soccer club become a reality. We are very thankful for all the work she has done to help form the Big Cat Soccer Club. 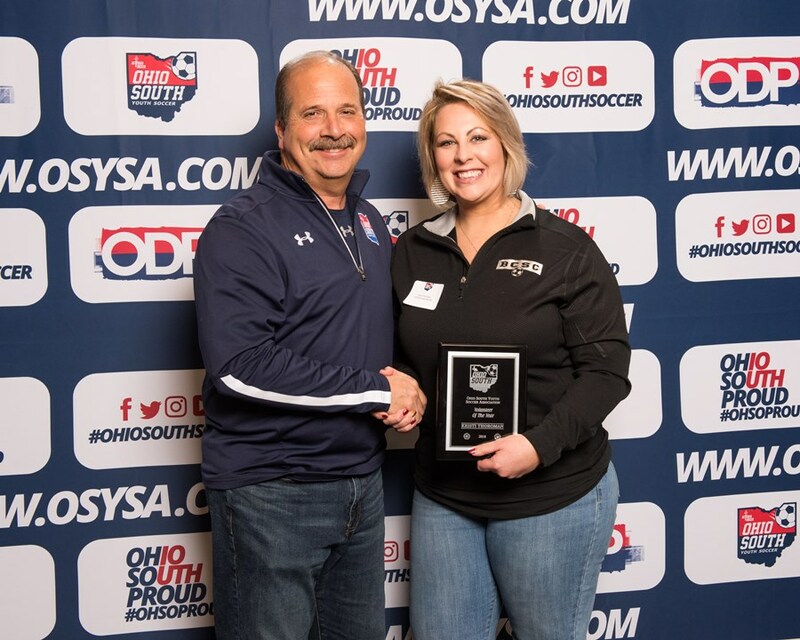 Lisa became involved in soccer when her oldest daughter started playing recreational soccer and her husband Greg was the team coach for the Lakota Sports Club. Lisa started as a team mom, before becoming the Girls Registrar, and finally the Club Admin for all teams. Lisa is involved in Tournament Registration, Player and Team Registration, and International Clearances. She has worked diligently with the new registration system to get 3000+ players to a full online management and payment program. She also works with admins to teach and develop best practices. Lisa is an original board member of CUSC and is a critical part of Cincinnati United. 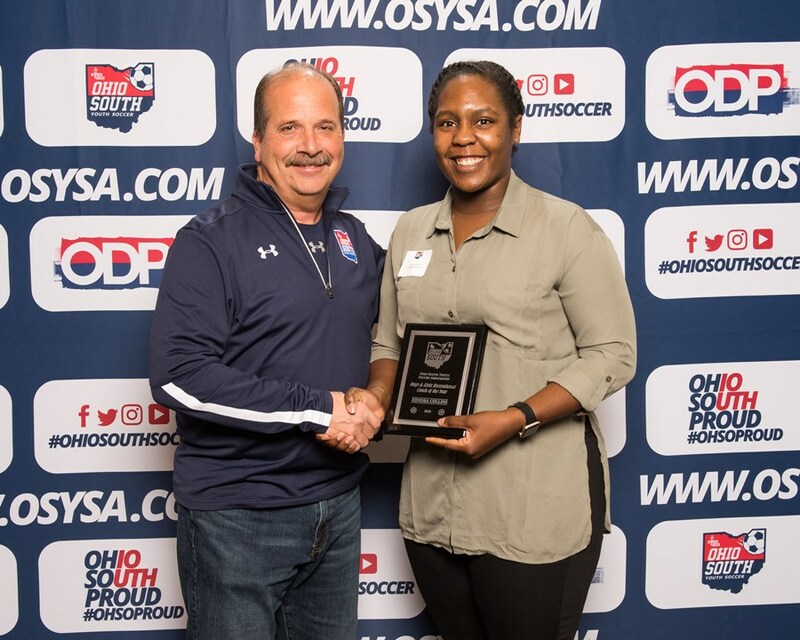 Michayla began playing SAY soccer then played club soccer for Boro Blast, Warren County and Club Ohio through her 8th grade year. She is on her third year of refereeing which has made her a more independent and responsible person. Michayla always arrives early and prepared for every game without any complaints no matter the weather. She has participated in multiple mentoring sessions looking to improve her skills as a referee. She is also a team player; she leads as an example, but can also follow when appropriate on the field. Upon graduating from high school, she plans on joining the Ohio National Guard Reserves while attending college. Tyler has been involved in soccer since he was four years old. He played SAY soccer until he was seven and pivoted to club soccer from age 8 through high school. He played for Cincinnati United as well as the Loveland High school soccer team. Soccer has had an immense effect on his life. He had to work hard to gain the endurance needed to pass the fitness tests and he needed to commit to hard work in order to progress. The hard work and commitment translated to other aspects of his life in which he was the Salutatorian of the Loveland High School Class of 2018. In addition, playing soccer has improved his leadership qualities. In order to improve his knowledge of the game, Tyler watched increased amounts of English Premier League matches. In watching the games, he solely paid attention to the movements and signals of the Referees to help clarify both positioning on the field and foul recognition. 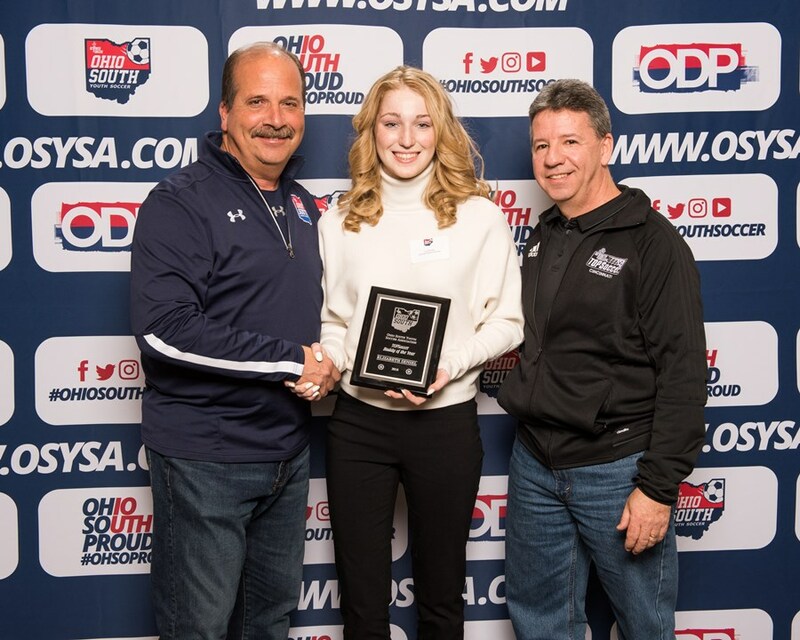 Congratulations to the 2017 Ohio South Youth Soccer Award winners! 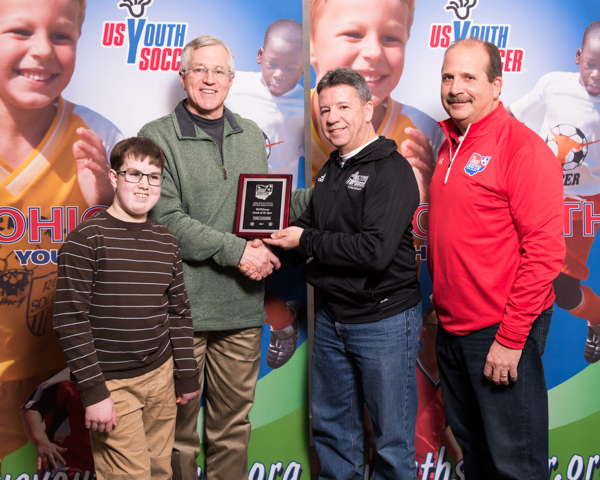 John was instrumental in the formation of the Beavercreek Soccer Association in 1975. Today, under the leadership of John Ankeney, the association supports 2500 players across 74 competitive teams and 100 recreational teams. Participating BSA players and their families live in over 50 different towns and cities in Ohio South. John works with a variety of soccer programs across the area in order to promote and foster the game and provide Ankeney Soccer Complex as a soccer facility for their use. John’s expertise in the development and management of Ankeney soccer complex is widely recognized in the Dayton area. 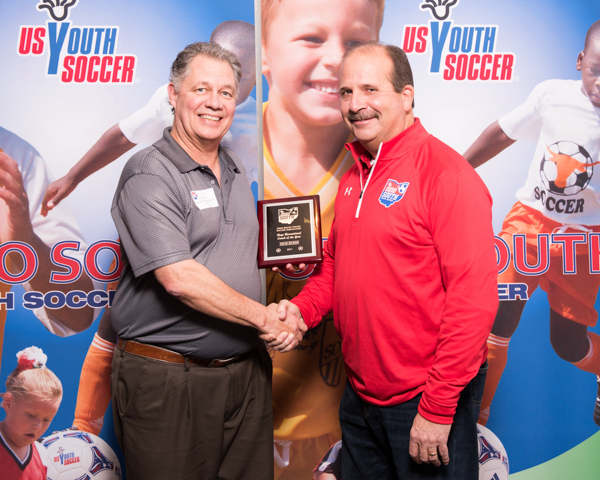 John has donated countless hours of his time and expertise to support the development of numerous additional soccer fields for both the community and local soccer clubs. Nick has been coaching in the Southeast Cincinnati Soccer Association for fourteen seasons. He began as a parent and stepped up to coach his son’s team. All of these years later, his enthusiasm for the game has only grown greater. Beyond coaching his team Nick steps up to help his league. When there are coaches meeting, he asks in advance, “What can I do to help?” Beyond congratulatory appreciation, parents added that this is a well-deserved honor and shared their appreciation of how Coach Nick has worked with their sons. Tom is a long-time coach that embodies the full spirit of Top Soccer. He always welcomes each child with a warm heart, making kids and their parents feel welcomed. Tom works very hard to provide a fun and productive experience for all players, and parents too. Tom shows flexibility and adaptability each practice or game day. He is creative in the way to coach the children while remaining focused on the kids having fun. It takes a great skill to be able to balance both and he makes it seem easy. 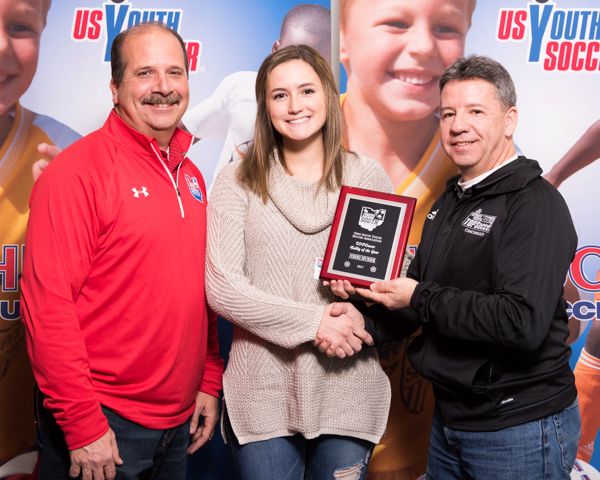 Nikki has been involved with the TopSoccer community throughout her high school years. While she is a senior now, she still plans to stay involved. She has been a buddy with the Rollers program and a variety of ages. She has helped with the fall league, tournament, spring sessions and summer camps. Her positive attitude advances the game and makes other people want to participate as players and volunteers. On the field, she is consistently one of the first to arrive and last to leave. She encourages players to be active and excited in the games. Nikki is one of the rare volunteers who gives so much of herself because she truly loves the kids and the program. Soccer has been a part of Brandon’s life since his earliest memories. His love for officiating began by watching his father officiate. At age twelve, Brandon began officiating. Brandon has been successful as a referee officiating some of the top tier leagues and tournaments; MRL, NPL, OSSL, BPYSL, Blue Chip and State Cup. He has enjoyed sharing his passion for the game by exposing others to the game. He plays three sports in High School. Many times he finds himself explaining the finer details of the rules of soccer to his teammates and coaches. Being an official is one of the most influential things he has experienced. These opportunities have helped him take responsibilities for the way he conducts himself. Jodi joined the Botkins Soccer Club board in 2011. Jodi has shown that she is one who can truly unite others. Numbers in the club have gone up since she became the board president. With her guidance, the board was also able to find more people to help coach teams and join the board. She created and updated registrations and sponsor forms. She attended Village Council meetings and Botkins school board meetings. By doing so she made sure they were aware of the clubs needs. Jodi’s involvement highlighted all of her strengths. Jodi also helped support the Kickin’ It in the Dark 3v3 tournament that they Botkins varsity coach organizes. She has moved to a chairperson position with the Botkins Soccer club, and she is still very involved with other community organizations. Tom encourages sportsmanship each and every day in training and games. Coach Tom has been a coach with the Crew SC Player Development program for the past 7 years. As a former player of Columbus Crew SC, it is understandable to see him relate to the advanced player and have success with Crew SC Pre-Academy teams, but what makes Tom special is his ability to also work with young players. Tom currently has a U.S.S.F F license, is in communication with U.S Soccer for advancement onto his “C” or “B” license and is an evaluator for the Pro team. He is currently a board member on the Crew SC foundation, which coordinates fundraising to benefit underprivileged soccer programs. Players start each practice with giving high fives to each other, and are taught to treat each other with respect. Coach Tom is constantly willing to go above and beyond the program standards/ requirements by offering additional playing opportunities such as pick up soccer over the summer to indoor over the winter. His competitive spirit and knowledge of the game allows players to maximize their potential while developing a passion for the game. Josh is very active in the soccer community. He attends games of other teams and positively influences older or younger, better or weaker teams. To continue his education Josh has his E license and has taken the goalkeeper course. He promotes sportsmanship in a huge way. He pushes players to do their best through practices and games. Josh’s philosophy is 100% effort at all times. Winning or losing doesn’t matter to him, he just wants players to put their all into every practice and game. Greg’s leadership has gone above and beyond to develop teams. He is much more than a youth coach; he is a teacher, mentor and community leader. Greg played sports in college and always looked back on his experiences with the coaches that he had growing up. He is able to use his past experiences and is able to motivate the variety of kids and their backgrounds so they will have a positive experience when it comes to sports. Greg has coached 5 years of recreational boy’s soccer, 3 years of recreational girl’s soccer and 3 years of competitive boy’s soccer. Greg is a great role model for players. He makes a point of developing a sense of pride in sportsmanship. Lauren was involved in soccer at a very young age. Starting out playing recreational soccer, she continued to grow and play more, due to her love of the game. Eventually, she played club to better herself, and ultimately ended up playing high school soccer and officiating. Soccer has taught her a lot about teamwork, discipline, and leadership. Moral and ethical behavior is of the upmost importance to her. She believes respecting people on and off of the field is absolutely necessary. She often visits other referees’ games, in order to observe and learn how to better herself. She volunteers with several organizations in the community helping the local and broader communities.